An evil empire, an all-powerful weapon, a band of rebellious misfits, and a chance to bring balance back to the galaxy might sound familiar but such an adventure has never been more exciting or stirring. Michael Moreci is an accomplished comic book writer, having co-written one of 2015's best limited comic series 'Burning Fields' and completed his own sci-fi trilogy 'Roche Limit.' Spartantown doesn't usually review prose novels but Mr. Moreci was kind enough to supply us with a review copy and we're glad he did. 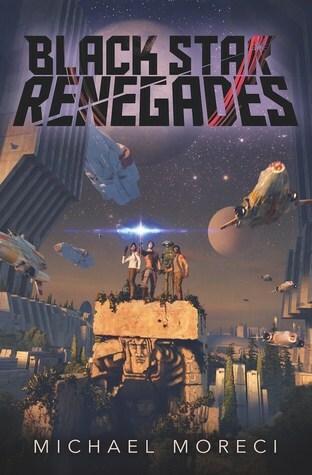 'Black Star Renegades' is an unabashed homage to sci-fi adventures like 'Star Wars' and 'Buck Rodgers.' This is endlessly entertaining not in spite of its familiarity but because of it. BSR is made for fans of rousing sci-fi adventures by a fan. 'Star Wars' itself was an amalgamation of various story tropes from Greek mythology to the Bible. Moreci follows a similar path to tell his hero's journey. After ten years under the tutelage of Ser Joken, a warrior in the service of The Well, Cade Sura and his brother Tristan are sent on a mission to recover an all-powerful weapon called the Rokura. A fatal outcome propels Cade, now mistaken for the Paragon or Chosen One, to assemble a ragtag band of misfits to make sure the Rokura doesn't fall in the hands of the evil Queen Ga Halle of the Praxis Empire. They've also got to take out the War Hammer spaceship of Praxis capable of destroying an entire planet. Moreci finds his own voice and drums his own beat however familiar the story might be. There's plenty of energy and personality from his band of space heroes that make them engaging with sprawling action sequences to have you cheering and your pulse pounding. 'Black Star Renegades' reveals Moreci's love and passion for space operas and in doing so reignites the reader's love as well. This is a fun, sure-fire hit.